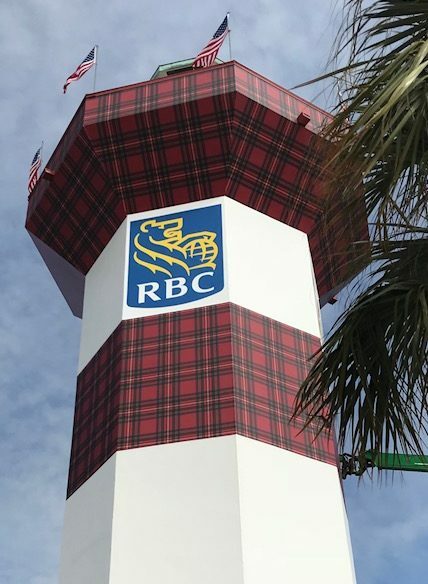 To commemorate the 50th anniversary of the RBC Heritage Golf Tournament, the famed Harbour Town Lighthouse, which also turns 50 this year, was given a temporary golf-themed facelift. The structure, located on Sea Pines Plantation in Hilton Head Island, S.C., has always been known for its red and white stripes, but now sports plaid and white stripes. The official color palette of the PGA event is plaid, so with the permission of Sea Pines Plantation, the Heritage Classic Foundation was given the approval to make the temporary modification. The Kennickell Group had to do a lot of measuring and testing of materials. The shop needed something that would stay for a few months but come off without damaging the historic structure. “We applied several materials two months in advance of the wrapping and went back to see how they did,” Kennickell says. In the end, an HP 3500 Latex Printer was used to print the design onto ORAFOL ORAJET 3953 Brick Stone Film, which was laminated with an ORAGUARD 290 matte finish. More than 3,300 square feet of vinyl was printed and cut into sections that had to be clearly marked for proper installation. Kennickell hired Jeremy Conner from “Who Did That!? !” for the install, a provider of installation services for unique structures, since this was a different kind of project from what the shop is used to. “It is nine stories high, so we needed people used to working on cranes at heights,” notes Kennickell. “Jeremy’s team did a great job.” A giant lift was used to reach the top of the nine-story structure, and the installation took four days. “We have wrapped NFL stadiums, skyscrapers and water towers, but never have we wrapped such an iconic and famous structure. It was a privilege and honor to be chosen by the Kennickell Group to partner with them on this project,” says Conner. Since the town is so in love with the lighthouse’s new digs, the installation will be up at least until the end of summer, instead of the original plan to break it down end of April. This wide-format project with a nod to classic golf culture deserves more than just a quietly rolling golf clap.